Father and son John and Richard Geldard, who run the Wraycastle flock at Low Foulshaw Farm, Gilpin Bridge, Kendal, won the Skipton title, the latest of many at the North Yorkshire venue, with their first prize shearling ewe, a December, 2012-born daughter and one of triplets by the family’s Parkgate Jack, their top-performing senior stock ram for three years and himself by the highly regarded Ballyhibben Paddy Power. The dam is a Banwy Immense-sired ewe. David Mawhinney is pictured with three generations of the Geldard family – Richard, George, aged nine, and John, along with their Skipton champion and reserve. Scanned carrying twins to Galtres Never Say Never Again, purchased for 2,500gns at this year’s Worcester Premier Sale, the victor sold for 720gns to Messrs Beaumont of Longridge, Preston. Another same way bred Wraycastle shearling ewe, just two days younger than the champion, picked up first prize honours in a special anniversary show class open to members of the society’s northern region, which covers Yorkshire, Lancashire and Cumbria. Also scanned carrying twins to Galtres Never Say Never Again, the ewe was then awarded the reserve championship by the show judge, British Charollais Sheep Society chairman David Mawhinney, who runs the Rockvilla pedigree flock in Newtonlands, County Down, and had travelled over specially for the landmark fixture, which was sponsored by JG Animal Health. Breed stalwarts Charles and Valerie Marwood, whose Foulrice flock is based at Whenby, York, were again prominent among the prizewinners with the third prize shearling ewe, by their own Foulrice Lightening, out of a Foulrice Eboracum-sired ewe. 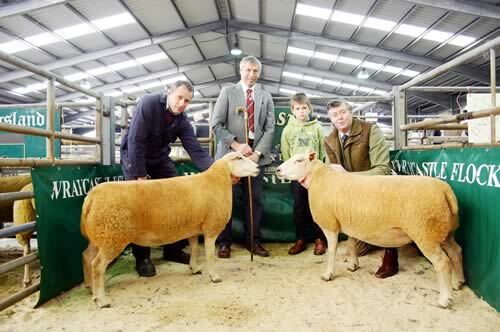 Scanned carrying twins to Lowereye Neil’s Favourite, she was sold for 550gns to S Cummings. Another Marwood shearling ewe, a Langstone K2 daughter also scanned in-lamb to Lowereye Neil’s Favourite, was awarded second prize in the northern region show class. On a good day, the Marwoods were also responsible for the first and second prize ewe lambs, two further Foulrice Lightening daughters. The red rosette winner, out of an Edstaston Head Master-sired ewe sold for 600gns to Messrs Tindall with the runner-up making 400gns, claimed by Kenton Foster for his new Kentons Flock.